Besøk tre av Tyrkiets viktigste historiske og åndelige steder på denne helgedagstur fra Istanbul, og reise i stil med en privat guide, rundturer og luksustransport av Mercedes-Benz. Utforsk de gamle ruinene av UNESCO-listet Efesos og stå i ærefrykt for Grand Theatre og Celsus Library, og besøk deretter Jomfru Maria, hvor Jesu mor tilbrakte sine siste dager. Til slutt, se de sparsomme ruinene til Temple of Artemis, en av de syv underverkene i den gamle verden. 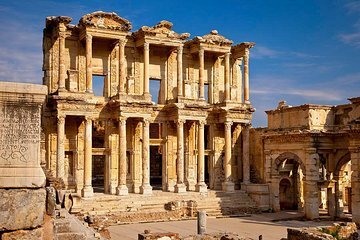 I enjoyed the tour very much and my guide was very kind and knowledgeable, but I think it would be better to have fewer commercial excursions and a little more time in Ephesus proper. City of Sultans are the best of the best in Turkey when it comes to executing tours with precision. The private tour from Istanbul to ephesus cant be more organised and perfect than this. Ozgur is supreme planner and Iskender our tour guide was so knowledgeable that he made the tour perfect. The tour to Ephesus was awesome, everything was perfect. The transfers in Istanbul and Izmir, the tour guide, the locations, the lunch, the flight tickets, everything worked pretty well. The tour guide in Ephesus was excellent, made a complete travel to the history of the place and Turkey, explained every little detail, and had a perfect spoken English. I truly recommend City of Sultans as a travel agency in Instabul. simplesmente espectacular. recomendo. tudo muito bem organizado.